Why Use Resolve Wild Yam Cream? | Syringa Inc.
Why Use Resolve Wild Yam Cream? Resolve Wild Yam Cream is Syringa’s most well known and popular product. Our yam cream is made with an extract derived from Mexican Wild Yams. Why a cream you ask? We wanted to have the easiest and most effective form of application. Your body can absorb minerals, nutrients, and vitamins through the skin. Oral drops are much less effective because much of the nutrients are lost through the digestive process. Plus the Resolve is an excellent skin moisturizer and even makes a great night cream for your face. Those plant nutrients are excellent for your skin! 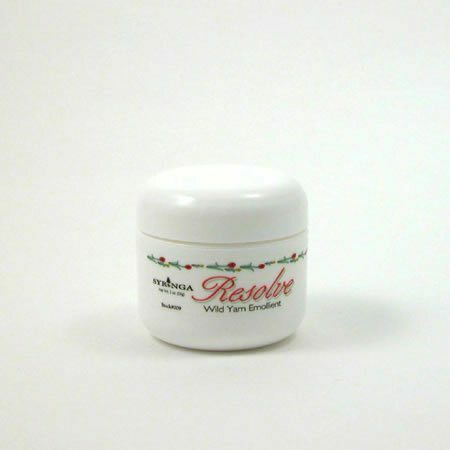 What Does Resolve Wild Yam Cream Do? Resolve is a topically applied skin cream containing Mexican Wild Yam Extract and other plant nutrients. It contains NO added drugs or hormones. It is a natural source of the nutritional chemistry which can be used by the body to manufacture progesterone, alleviating the symptoms of hormonal imbalance. Currently the most common method of addressing a woman’s hormonal needs is to prescribe synthetic hormones. While there is some value to this treatment, these medications do carry potential risks and side effects. The best case scenario would be for a woman’s body to naturally produce the needed progesterone on its own. This is possible with the use of natural, nutritional sources. A progesterone-like plant sterol called diosgenin is available to assist the body in creating its own progesterone. This sterol is found in nearly 5,000 plant sources, the richest of which is the Mexican Wild Yam. Resolve has been available commercially for over 20 years. In that time countless women have used it to help naturally alleviate the symptoms of PMS and menopause without the use of synthetic and expensive HRT drugs. Give it a try today! If you like what your reading, be sure to check us out on Facebook for more information. I have been using Resolve since November or December of 1993. I had my sister recommend it to me after my hysterectomy. It has helped me so much! I feel it has helped my immune system, my bone density and many other things. I was one of the first three people in Utah to start using Resolve. Ron and his daughter, Barbara I believe, held a meeting here and I attended. I wish every woman would get their hormone levels checked before they have a hysterectomy. Then they would know what their hormone levels should be. I would like to encourage every woman to use it for the sake of their physical and mental health. I am truly converted to using Resolve (by Syringa) for the rest of my life.